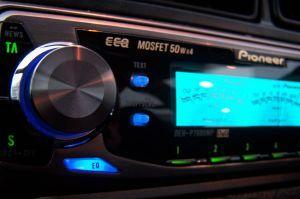 If you've purchased a new sound system for your car, then you're probably wondering how to hook up a car stereo. While the process certainly takes some time, it is definitely possible to accomplish this task even if you have no technical training with car electronics. Head unit - This is the main component of the stereo, which usually has the radio, CD player, and other controls. Main speakers - There are usually two speakers in the front of the car and two in the back. If you use "component speakers," each speaker may be split into two smaller units to play the bass and the treble. This only means there will be more wires coming back to the head unit. Amp and Subwoofers - An amplifier provides additional channels and extra power for a pair of subwoofers, which enhance the bass of the music you play. Speakers - If your new stereo didn't come with speakers, make sure to buy the best set that you can afford. Wiring harness - Before you can replace your car stereo, you need to visit the manufacturer website of the car stereo brand you intend to buy and purchase the correct wiring harness required for your specific vehicle. You could also possibly purchase it from your local car electronics dealer. Learn how to remove the dash, door panels and floor molding for the make and model of your car. You may be able to find this information in the owner's manual for your car. If not, visit your car manufacturer website and search for instructions. Once you have everything you need, you're ready to get started. If you work through the following steps carefully, you'll end up with a fully functioning, brand new car stereo. If you are very scared about causing damage, visit your local car stereo retailer and ask about the price of installation.When you have the guide for removing interior panels and the dashboard, make sure to read through it carefully before you start so that you know if there are any special tools you're going to need. IMPORTANT - Disconnect your battery (the negative cable) so that your car's electrical system is not live. Remove the paneling according to the instructions in the guide that you purchased, and unscrew and disconnect the old speakers. This may mean either sliding the existing electrical connections off a connector, or cutting the wires completely. Reconnect the old wires to the new speaker, connecting the same colored wires together - negative to negative and positive to positive. If you had to clip the old wires, strip about a half inch of insulation back for both wires, twist them together and wrap tightly in electrical tape. Then screw the new speaker back in place. Remove the section of the dash that covers your old car stereo, and take off the existing head unit by removing the screws that hold it in place. Unplug the old head unit from the existing connectors. Attach your new wiring harness to your car's connector, and then attach the other end of the wiring harness to your new stereo. All connections should be clear and easy to connect because the harness is manufactured specifically for your car and for the brand of the new stereo. Connect the other wires that aren't part of the connector, such as the antenna and the speaker wires. Each channel is a speaker with two wires. Not sure which wire is positive or negative? Touch the wires to the 9 volt battery terminals. If the speaker moves outward, then the wire on the positive terminal of the battery is positive. If it moves inward, then it's negative. If you have an amplifier as part of your sound system, use the o-ring that came with it to clamp the red power cable to the part of the connector that supplies power. Don't forget to insert the fuse into the fuse holder for this power connection. You will have to run the amplifier power cable and the thin "remote on" wire along the plastic molding along the floor of your car to the back of the car (usually the trunk area behind the back seats). Also run the signal cable (which came with the amp) along the other side of the car under the molding. Attach the black ground cable from your amplifier to any bolt on the inside of the frame of your vehicle. Then, attach the power, remote on, and signal cables as described by the amplifier manual. Finally, double check all connections on the back of your head unit (also make sure the ground cable is connected), and then mount it back onto the dash. Turn the stereo on, and make sure every speaker works correctly. If anything isn't operating, double-check the wiring on the back of the head unit and on each speaker or amp. Re-attach the dash and you're finished! Learning how to hook up a car stereo doesn't have to turn into a nightmare. By working slowly and methodically and making sure that you understand every step along the way, you'll have that perfect car audio system that you've always wanted.